Just caught the last Sundance Film Festival showing of a very powerful, very disturbing film called Compliance. Directed by Craig Zobel, it documents the strip search prank scam that hit over 70 fast food restaurants over 10 years and 30 states. This is why it's so damn disturbing. It was real. At a local franchise of the ChickWich chain located in a snowy Ohio town, middle-aged store manager Sandra (Ann Dowd) briefs her mostly young and disinterested staff on the key points of her stressful day: an employee oversight has spoiled the bacon so supplies are low and a secret shopper from headquarters could be dropping by at any time. Late as usual, cute, 19-year-old blonde Becky (Dreama Walker) gives Sandra some unwelcome attitude and proceeds to slack off when she’s not serving customers at the counter. Sandra gets a phone call mid-shift from a male caller claiming to be police officer Daniels (Pat Healy), who explains that the cops have received a complaint that Becky stole some money from a customer’s purse earlier in the day. He insists that Sandra will need to question Becky about the theft, since he says he’s occupied with a search of Becky’s home as part of a larger investigation. Hesitant at first, Sandra agrees to assist the officer and brings Becky into the back office, where the girl denies any involvement with the theft. With Daniels still on the phone directing the investigation, Sandra becomes his proxy, relaying his questions to Becky or handing the phone to her so he can question Becky directly. Daniels’ voice is calm, insistent and commanding, with an attitude that brooks no resistance. Tensions escalate after Sandra’s search of Becky’s purse and pockets doesn’t turn up the missing money and Daniels directs her to strip-search her employee, saying the only alternative is for the cops to jail Becky while the investigation continues. After eliciting Becky’s compliance, Sandra agrees, calling in her assistant manager to be present while Becky strips and they search her clothes, with no result. In a chilling scene of dread and humiliation, Daniels demands that Becky strip completely naked to be certain there’s nothing hidden in her underclothes. Daniels insists that Becky must remain naked, although a coworker gives her an apron to put on while he directs Sandra to put Becky’s clothes in her car and leave it unlocked so the police can collect the evidence. Sandra then insists on going back to work in the busy restaurant and Daniels directs her to have a male employee watch Becky “for security purposes.” Daniels then follows with a series of increasingly invasive search techniques and questions about Becky’s body, accompanied by reluctant cooperation on the part of several men that Sandra recruits for assistance, with appalling results. 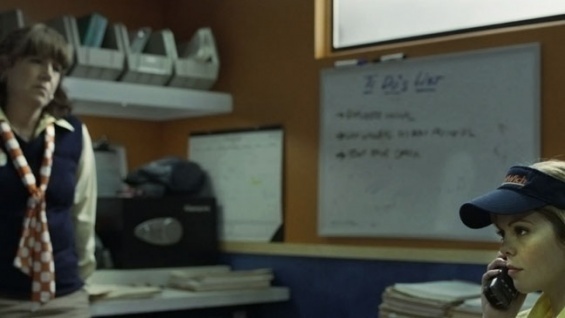 Scene-by-scene, the film details the insidious rhetorical tricks the prank caller uses to get compliance from weak and powerless fast food restaurant workers. The workers aren't evil. They might be stupid. But it's clear that they think they're doing the right thing at each moment. The reaction at Sundance has been heavily polarized. Many walked out of early screenings, with the first showing even sparking fiery and angry shouts from the crowd at the Q&A session afterwards. The showing I went to was no different. Some in the audience were visibly agitated. It's no mistake that those most susceptible to this prank were fast food workers, whose entire industry is predicated on systematically cultivating dependable, compliant, unquestioning workers who can perform menial tasks with little deviation. The most shocking and/or intriguing part of the film was how those who had the power to stop it didn't. It was like watching a frog being slowly boiled alive. You could not have a more direct portrayal of the banality of evil -- that phrase coined by Hannah Arendt used to describe the Holocaust -- that such evil happens not at the hands of fanatics or sociopaths but people merely believing they are doing normal things. That evil can be perpetrated through the guise of authority is not surprising in and of itself. What is revolting and unacceptable to us is how it calls into question our very social contract. We are supposed to be kept safe, that the powers that be are benevolent and have our best interests at heart. But how can we trust that when there are situations in which we do not question authority at all? The whole system might be corrupt. Ultimately, the film serves as a powerful reminder of how much we have to continue to rage against the machine. We must challenge and question authority and the way things are. We must evaluate that which society has us do, no matter whether it asks or tells. To shirk this duty is to abdicate our basic responsibilities to ourselves and each other. The actor Sharlto Copley (Wikus in District 9) makes a great appearance in here too. You can absolutely see how the concept built out in this short 6:30 piece was just born to be created into something bigger. There's a political message in here too. The footage of South African locals talking about aliens was actually footage of director Neill Blomkamp interviewing Soweto residents about other Zimbabwean and Nigerian migrants. Kind of an obvious allegory going on here-- aliens being a stand in for the 'other,' even among South Africans who suffered under apartheid. District 9 was mind blowingly awesome. Can you even believe this is Neill Blomkamp's first feature film? I'm blown away, impressed and inspired. Really cool video by Daniel Carbone, so retro, but you can tell its totally modern because early in the shot there's a Nissan Altima. Makes me want to run out and play with a Super 8. Can you imagine the possibilities of Super 8 + nonlinear editing? Wow, Kirk Mastin taped a Flip video camera to a $3,500 Canon XH-A1 + pro mic, and filmed a mini-short with both of them filming identical footage. He then runs through it one after another, and you can barely tell the difference. The main difference actually is the sound quality, and even that isn't significant at all. This is apparently the video blog entry that caused the NYTimes to pick up the Flip camera. Anyway, Kirk Mastin, your blog rocks. And also I just finally ordered a Flip Mino HD myself. I'm absolutely inspired by the storytelling possibilities.